The Perseid meteor shower, the most reliably active meteor shower of the year, peaks on the night of August 11-12, 2015. The Perseids are a favorite of many stargazers. They happen in the northern summer, which makes for comfortable viewing. They display more bright meteors than most showers, usually about 50-60 per hour. And this year, the nearly-new Moon will not get in this way of the Perseids, so 2015 will be an excellent year to see this meteor shower. While the meteors move into the Earth’s atmosphere on parallel paths, they appear to radiate from a single point in the sky called a radiant. The effect is similar to falling snowflakes that seem to radiate from a point in front of your windshield as you drive into a snowstorm. The radiant of the Perseid meteors is found in the northern constellation Perseus close to the neighboring constellation Cassoipeia. The Perseids build slowly, starting in late July when you might see 3 to 4 an hour. They peak when Earth passes through the thickest part of the debris stream on August 11-12. At the peak of the show, in clear, dark sky, you might see as many as 60 meteors an hour. 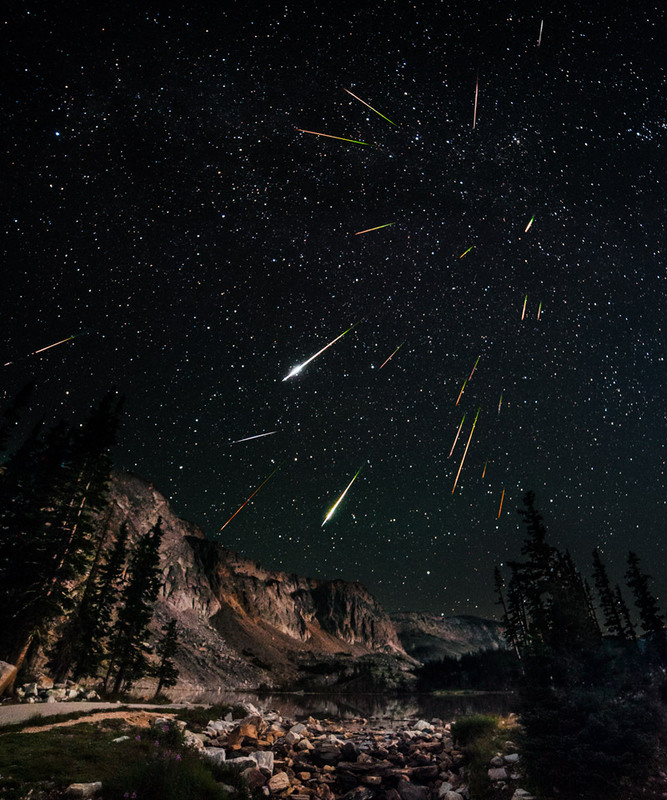 In medieval Europe, the Perseids were called the “Tears of St. Lawrence” because they occur near the anniversary of the death of Laurentius, a Christian deacon who was martyred by the Roman Emperor Valerian in the year 258 A.D. The first recorded observation of the Perseids was by Chinese astronomers in 36 A.D.